Recognized by many prominent wine writers and critics —including Robinson — as the world’s greatest white wine, Riesling is astonishingly difficult to sell commercially. Even though it’s one of the most versatile food matches around, it’s an endangered species on restaurant wine lists. Riesling still lugs around baggage from the bad old days of Liebfraumilch-style Riesling in the 1960s and 1970s — those cheap, thin, sugar-water wines that hit the U.S. market by the tankerful. But with quality-conscious producers on several continents, an unprecedented string of ten consecutive good-to-great vintages in Germany (Riesling’s homeland) and an increased willingness by consumers to try something new, this under-appreciated variety is making a strong comeback. German Riesling remains the benchmark for this international variety. Or rather, it’s a series of benchmarks since bottles from the chilly slopes along the Mosel and the somewhat balmier vineyards of Baden offer very different pleasures. Austria and Alsace also produce outstanding Riesling — bigger and drier than in most of Germany, but still retaining the distinctive, beguiling aromatics. Australia and New Zealand make their share, predictably over-the-top in Australia and verging on Sauvignon Blanc-like grassiness in New Zealand. After decades of flabby versions from growing regions that were too warm, California has found spots in the Anderson Valley of Mendocino County and in Santa Barbara where Riesling comes into its natural own. Along the Columbia Gorge and in the Yakima Valley, Washington State has emerged as a major producer. But the New World’s best Rieslings, hands down, come from the Finger Lakes region of upstate New York — in my book, the only ones that give the Germans a run for their money. What all the good ones have in common is a unique combination of intense fruit — peaches, apricots and sometimes even red fruits like raspberries, laced with honey and perfumed with flowers — and spine-tingling acidity. In most cases, this one-two punch is delivered without a high-alcohol uppercut. Some of the best Riesling on earth comes in at eight or nine percent alcohol. Riesling works in a wide range of styles and sweetness levels, from bone dry to super-sticky, in still wines and sparklers. The common prejudice that Riesling is “too sweet” is misguided on two counts: not all Riesling is sweet and, come to think of it, what’s wrong with sweet? If that’s not enough, Riesling gets many people’s votes for the world’s ultimate terroir wine, able to convey the underlying minerality of its place of origin with startling clarity. And finally, the backbone of minerals and acid (often laced with a touch of sweetness) means that — more than any other white wine — Riesling can age beautifully, taking on a whole new world of flavors and aromas. Cool is the watchword for Riesling from start to finish — from where it’s grown, to how it’s made, to how it tastes. In warm climates, Riesling cannot sustain the acidity it thrives on and the resulting wine is in danger of being short on fruit, too high in alcohol, unbalanced and insipid. Adding acid during winemaking can make the numbers look better, but it can’t restore the flavors that too much sun bakes out. Look for grapes from upstate New York and elsewhere in the Northeast, from Ontario and British Columbia’s Okanagan, from Washington and the cooler parts of California. If you can’t find a fresh source, frozen Riesling is an excellent alternative. For the uninitiated, harvest numbers for Riesling can sound alarming. Compared to, say, Chardonnay, Riesling registers very low sugar and pH, and unusually high total acidity (TA). From talking with commercial winemakers in the Finger Lakes (see the “New York Riesling Rules!” sidebar), typical harvest numbers range from 18–22 °Brix. Riesling’s pH ranges from 3.0 to 3.3 and pH values below 3 are not unheard of. Total acidity (TA) ranges from 8 to 10 grams per liter (g/L) or even a bit higher. The TA will drop during fermentation (by perhaps a gram per liter) and later during cold stabilization (another half a gram); but comparatively high acidity is part of what makes Riesling sing. If you’re working with fresh grapes, sort through them and discard defective or damaged clusters, including excessively green bunches, badly shriveled bunches or clusters that show signs of mold or rot. Of course there’s rot and then there’s rot: late harvest Riesling affected by the noble Botrytis cinerea can make memorable dessert wines, but bird damage and garden-variety mold shouldn’t be welcome at the crusher. Keep the fruit cool, and make sure to have the temperature down — under 70 °F (21 °C) before crushing. Most Riesling is made with a minimum of skin contact. The grapes go immediately from crusher to press and many wineries employ whole-cluster pressing to telescope the process even further. (There are, however, some notable exceptions. See the New York sidebar for one.) Keep the juice cool. Try to get the temperature down to 50 °F (10 °C) or so, using refrigeration or putting carboys in tubs of ice water as needed. Settle the juice at least overnight and rack gently off whatever sludge and solids sink to the bottom. It’s always good to have a final wine style in mind before starting a fermentation. In this case, a key decision is the target sweetness level for the final product. The primary consideration, of course, is what kind of Riesling you want to be drinking when you’re done — fully dry, slightly off-dry or noticeably sweet. (I’m not going to deal with truly sticky dessert wines or ice wines in this article.) If you’re aiming for the sweet side, say 2–3% residual sugar, you may want to reserve a small volume of unfermented juice. Keep the juice in your freezer then add it back into the wine at the end, rather than adding plain sugar. If the acid level of your juice is quite high (over 8 g/L), a touch of sweetness may make for better balance. Conversely, if your goal is a sweet wine and the initial acid level is on the low side (7 g/L or less), it may be necessary to make an addition of a gram or two per liter of tartaric acid at the start. Even with squeaky clean fruit and juice, an initial addition of 25–50 ppm of SO2 is standard practice. (That’s roughly two to four Campden tablets or two to four tablespoons of a 3.2% potassium metabisulfite solution per five gallons of potential wine.) Remember, most of this will dissipate during fermentation; the potentially tricky part of SO2 levels in low pH wines comes along later. Since Riesling is almost never put through an intentional malolactic (ML) fermentation, treatment with lysozyme to help suppress bacterial action is worth considering. A good yeast choice for Riesling should work comparatively slowly, tolerate cool temperatures well and preserve the delicate floral and mineral characteristics of the variety. Epernay II (Côte des Blancs) and D-47 are commonly available options. If you’re willing to do a little more hunting, there are a number of German-bred yeast strains that work well. This is not the place for a ripping-fast Montrachet yeast. Add DAP, Superfood or some other yeast nutrient as directed. Make sure to leave room in air-locked carboys or other closed fermenters for the foamy yeast head that will develop. One last time on the broken record of “cool:” keep the fermentation temperature down, preferably somewhere in the 50’s. A low-and-slow fermentation does a better job of capturing Riesling’s charming, elusive aromatics. In addition, the longer fermentation time — three or four weeks isn’t uncommon — extracts more goodies from the solids. Since few home winemakers have access to tanks with glycol jackets, some ingenuity may be required. I frequently put carboys of my Rieslings and other aromatic whites outside at night to bring temperatures down, or rotate them in and out of a spare refrigerator for a few hours every day. It’s worth the trouble, just as it’s worth the trouble of hooking up an electric blanket to get small batches of fermenting red wines up above 80 °F (27 °C). If you plan to ferment your Riesling dry and keep it that way, skip to the next section. But since many terrific Rieslings from several continents sport at least a pinch of residual sugar, the options for getting and keeping it there need some review. Commercial operations that want to retain some sugar will set a target (depending on the harvest numbers) and continually monitor the drop in Brix. When the target is reached, cooling jackets quickly knock the temperature down to around the freezing point. The yeast cells are either killed or made dormant by the temperature drop. The wine is then racked and dosed with sulfite, and sometimes filtered as well, to dramatically reduce the yeast population. Commercial wines with residual sugar routinely go through a sterile filtration before bottling. Since few home winemakers have sophisticated refrigeration or filtration equipment, the next choice is knocking out the yeast with potassium sorbate, in the form of Sorbistat K or some other preparation. Sorbate does not kill yeast, but renders it inactive. A fermentation can be stopped by chilling the wine (that spare refrigerator again), adding sorbate and hitting it with an aditional 25–50 ppm of SO2. But this approach is about as graceful — and as effective — as eating peas with a knife. The limitation of the stop-it-with-sorbate method is its lack of precision; since the fermentation won’t stop immediately, you may or may not hit the final sugar level you’re aiming for. Fortunately, there’s a third option, probably the best for home winemaking: Ferment the wine dry, treat it with sorbate for stability and then reintroduce sweetness to the exact level you desire. Working with a dry base wine lets you do tasting trials to find out if the wine is happier at 1% residual sugar or 1.5%, or whether an almost subliminal addition of 0.5% magically pumps up the fruitiness and improves the balance. Once the wine is dry, settled and largely clarified, treat with sorbate and rack a few days later. As long as no new yeast population is introduced — for example, by a large addition of untreated topping wine — the wine should remain stable through aging, bottling and beyond. The most obvious way to introduce sweetness is to make a sugar and water syrup, using as little water as possible, and add it to the wine. If a significant amount of water is involved, remember to adjust the acidity. A liter of sugar-water added to a carboy, for example, should include six or seven grams of dissolved acid. Putting in a modest amount of unfermented Riesling juice, however, has a number of advantages: no dilution with water, no lowering of the wine’s acidity and a boost in fresh fruit flavors and aromas in the final wine. This is why keeping a small amount of juice in the freezer is a great resource. Sugar additions (from cane sugar or juice) can be done at any time after treatment with sorbate. But there’s no rush; let the dry wine age for a while, go through a couple rackings, let the wine’s character emerge, dose it with sorbate and then do the tasting trials and sweetness adjustment. A few more things to keep in mind. Stopping a fermentation with some sugar still unfermented — true residual sugar — will produce a lower-alcohol wine than the alternative of fermenting dry and re-introducing sugar. For lightly sweet, off-dry wines, the differences are small; for sticky dessert wines, it’s generally better to stop the fermentation before dryness (refrigeration) and keep the alcohol down. Second, whatever treatment you use, keep an eye on your wine to make sure there are no signs of renewed yeast fermentation activity. And finally, when sorbate is used for an off-dry or sweet wine, make very, very sure the wine does not go through malolactic fermentation. This will result in geranium flavors and aromas, not part of Riesling’s normal floral bouquet. Once fermentation is complete, rack the wine. If significant solids and debris show up within two or three weeks, rack again. Riesling is not a variety that benefits from extended lees contact or the kind of lees stirring activity that can benefit some other whites. The goal should be to get the wine clean and clear as soon as possible. Most Riesling is aged in stainless steel (or glass at home), not barrel aged. Some producers use large, neutral wood ovals, not to add any distracting oak flavors but to aid in concentrating the wine. A total of three or four rackings over the course of four to six months should produce clean wine. Keep the temperature down and air out throughout aging. Keep containers topped up, and monitor SO2 levels. Again, correlate sulfite additions and levels to the pH of your wine — make sure there’s enough to keep ML activity and bacterial spoilage at bay, but not so much that there’s a sensory sulfur impression. If your wine’s pH is very low and sulfite additions were done at the crusher and after the end of the primary fermentation, you may not need much. Make sure to test for evidence of unplanned ML; guesswork and wishful thinking can be risky. Besides tinkering with the level of sweetness, it’s worth considering the use of your Riesling in blending. Even though the great majority of Riesling stands on its own, there are some intriguing and imaginative blends out there on the market. A dry or off-dry Riesling can be enhanced — especially if it’s a little thin and shy — with a dollop of Muscat or Viognier, which tend to be somewhat heartier and more viscous. 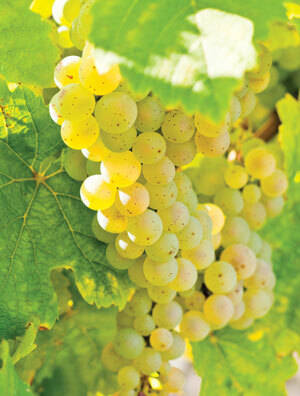 On the other hand, a bit of Riesling can give a lift to a lethargic Chardonnay, Pinot Blanc or Pinot Gris. New Yorkers are very adept at blending the vinifera Riesling with a number of the hybrid whites. Cold stabilization is standard commercial practice and worth doing at home if possible. The goal is to precipitate out some of the temperature-sensitive tartrates so that the bottle stuck in the back of your refrigerator doesn’t develop a sprinkling of crunchy (though tasteless and harmless) crystals in it. Two weeks at 40 °F (4 °C) does a reasonable home job, though commercial producers usually knock the temperature down into the low 30s (around 0 °C). Remember that cold stabilization will reduce the acidity of the wine by half a gram or so per liter — one of the reasons that seemingly high initial TA numbers are manageable. Commercial wineries almost always do a Bentonite fining on Riesling (and all their white wines) for heat stability. In a home context, the more important consideration is the use of one or another fining agent for clarity. Which fining is used depends on the level of cloudiness in the wine after a few months and on how important a crystal clear appearance is to the winemaker. Similarly, the decision to put the wine through filtration is mostly a cosmetic one. Since sterile filtration at home is a tough job, less stringent filtration (perhaps at the 5-micron level) should be employed as needed or desired for appearance. With the possible exception of filtration, do all of these finishing treatments at least a few days or preferably weeks before bottling, to make sure nothing has gone awry and no surprises have cropped up. Riesling is generally a quick wine that does its development in the bottle, not the tank or barrel. Bottling within six months is quite common. Follow normal bottling procedures, keep an eye on sanitation and consider a last small sulfite addition to make sure final free SO2 is at least 20 ppm. To make the final package look just right, track down some of the tall green or brown bottles traditional to Germany and central Europe. These are called “hoch,” meaning high, in the bottle trade. Riesling that gets bottled in March is ready to be uncorked for spring and summer drinking. It’s a great accompaniment to light and lively warm-weather foods, as well as the perfect back porch sipper on a hot afternoon. But after all that work, put a few bottles away to age, espeically if there’s a ;ittle sugar in the mix. Well-made Riesling keeps getting better and better. Grape descriptors and the region of origin were often used in the Old World in the naming of a grape. In the case of the Trebbiano family of grapes, this was indeed the case. Unfortunately what they didn’t quite know is the family is much more diverse than just a few varietals. Finesse the legendary grape from Burgundy.